One of our clients is one of the world’s largest logistics companies. With more than 1,000 locations in 32 countries, this company uses its vast network to help clients improve productivity and reduce costs. Our client’s Connecticut location is an enormous 800,000 square foot warehouse that serves hundreds of clients. The client wanted to update the lighting with an energy-efficient alternative that would not require an expensive re-lamping effort. An important consideration was very specific light level requirements; the vast warehouse includes areas that are specially designed for different parts of the logistics, shipping, and transport process, so the new lighting needed to be tailored according to the differing requirements across the warehouse. FSC Lighting transformed the warehouse with a customized retrofit with the 223-watt LEHB High Bay. 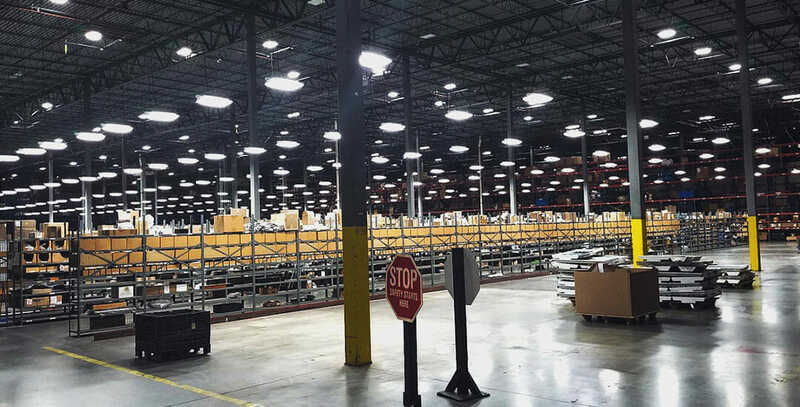 Depending on each fixture’s location in the warehouse, FSC installed either the 30 or 50-foot mounting height applications, and the spacing between fixtures was optimized based on the rack and open spaces. Each High Bay was also equipped with a remote-control dimmable sensor that included a built-in photo cell. The lights were programmed to turn on or dim automatically based on time of day or occupation of warehouse. Unlike the original fixtures, our LED lights include premium opaque lenses which obscure the LED chips while providing a clean, illuminating light that creates a safe and productive work environment for employees. These retrofitted lights use approximately 50% less energy than their fluorescent counterparts, which means considerable cost savings for the client. The long lifespan of these lights will similarly reduce costs by decreasing the need for ongoing maintenance. This project is an excellent example of how easily existing fluorescent lights can be retrofitted with LED alternatives while integrating a lighting control strategy.